Kentucky has 49 needle exchanges and many already have a one-for-one policy, but not all. Dennis Chaney heads the Barren River District Health Department which currently operated two exchanges in Warren and Barren counties. He says there can be benefits to one-for-one exchanges, such as holding intravenous drug users more accountable. “We know whenever any of us are held accountable for something, that brings about long-term sustained behavior change," Chaney told WKU Public Radio. Some research suggests that requiring a one-for-one exchange creates a barrier to participation. Louisville currently uses a needs-based model, which allows the number of new needles dispensed to be greater than the number returned. 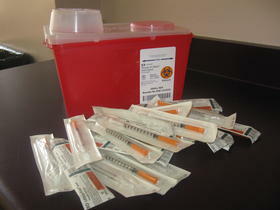 Some health experts fear that limiting the offerings of clean needles won’t do enough in preventing the spread of blood-borne diseases like HIV and Hepatitis C.
Health departments use the needle exchange programs to engage with drug users anonymously while offering education, free testing, and treatment options. In the two-and-a-half years since Warren County launched its needle exchange program, more than 30,000 clean needles have been handed out to intravenous drug users, according to health department data. Chaney says since the program began in 2016, two drug users have entered treatment and recovery. The Bowling Green program is serving about 140 consistent clients and 18 percent of them are coming from surrounding counties and Tennessee. More than half of those served by the exchange say they use drugs three to five times a day, and for most, meth remains their drug of choice. While their conversations are confidential and users don’t have to give their names, Chaney says the health department does ask for their zip codes. Based upon that information, the health department recently began a second needle exchange in Bowling Green. Once a month, clean syringes are being handed out at The Foundry in downtown Bowling Green on East 11th St. The second location is offered the 4th Friday of every month from 2:00-4:00 p.m.
Fort Mitchell will soon be home to a new initiative targeting the nation's opioid epidemic.